So, it's time I mention my travel blunder. The little (okay, GIANT) detail that I missed when planning our stay here in Rome. Well, I'll begin by giving you two terrific travel tips...one I was aware of and one I am now (painfully) aware of. Tip #1: When traveling in Europe one often gets more bang for the buck if you choose to rent an entire flat while a local is on holiday vs. simply booking a room at the Holiday Inn Italiano. It's interesting because you are often able to meet the owner of the home or flat before they depart - you could also luck into a great recommendation on a cafe or nice place to take a walk. Have you heard of the glorious Italian tradition of "Ferie"? Well, it's when all of the wise Italians take the entire month of August to go on Holiday. What a grand idea, one however, that I had never stopped to ask anyone "why?". "Why do Italians leave their beautiful homes and go elsewhere for a full month?" Dum dum dumm.. I now believe that Ferie happens because God has forsaken Italy in the 8th month of the year. He has turned on the giant heat lamp, "il sole", and he has walked away. Abandoning the Italians, and in turn us, leaving them to scatter for shelter and grasp for any semblance of a shadow they might find. So, while it is perfectly typical for homes in Italy (and throughout Europe) not to have AC (yep, you heard it - no air conditioning)...it's really advised against to choose one as a rental in August. Oops. So, it's day one and we've had the greatest pizza on earth as well as experienced the truest devastation - finding that our beloved Rome would likely top 105 degrees each afternoon during our stay. 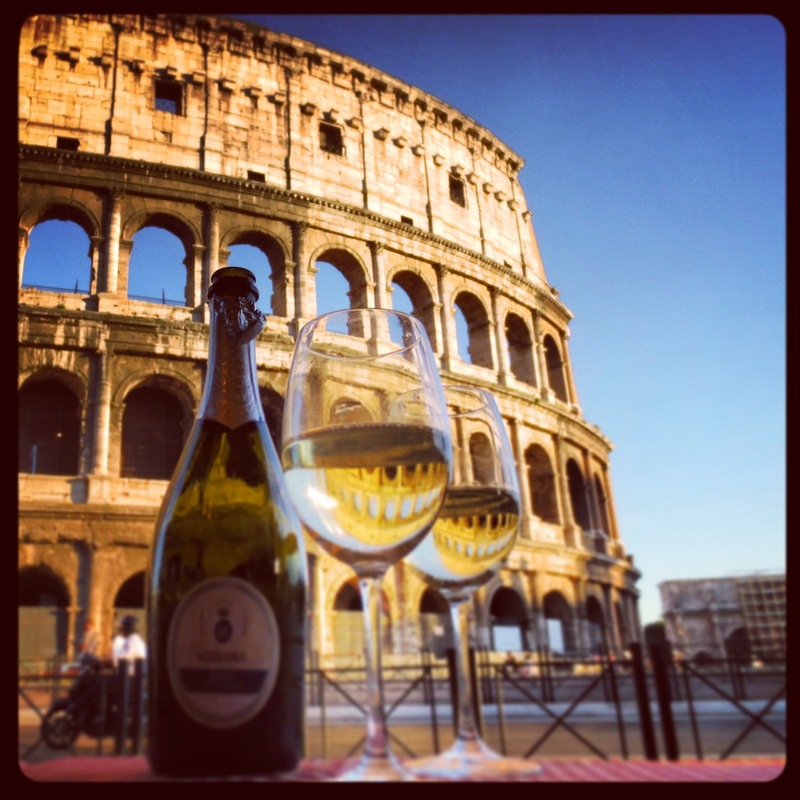 As we sit at the base of the remarkable Colosseum crying in our wine, knowing it is unlikely we will be able to enjoy the Eternal City the way we had imagined, we realize we must devise a plan. We notice that now (about 6pm local time), while it is quite humid and surely still in the 90's, it is tolerable as the unforgiving sun is considering resting for a few short hours. Hopefully it isn't merely the wine talking, but my easy-going husband (thank God!) and I have hatched what we believe to be a genius scheme. We are not going to fight the six hour time difference. Instead, we are going to embrace it - using it to our advantage. We're planning to sleep through the heat then shower and get ready for the day around 5pm. We plan to watch the sun set over the Tiber River before we adventure through the old cobblestone streets. We'll end our days watching the big orange ball appear just behind the Flavian Amphitheater (official name of the Colosseum...see, I told you this would be educational!). Wilhelm and I will explore the city by night, bypassing the hours of unbearable heat and the hoards of fanny-pack-clad tourists. Now, we do realize this will present a problem regarding tours and operating hours of the sights about Rome. But! With a bottle of wine (or two) and Rick Steves' audio guides (which by the way are AMAZING and free through his website) we are planning to get to know this beautiful city by moonlight. "Two roads diverged in a wood, and I — I took the one less traveled by, and that has made all the difference." So here's the deal. When I travel I want to get to know a city. I want an intimate experience with this mystical place I've dreamed of. I'm not one for tourist traps, and I don't search out a mere photo op. I'll skip the guided day tour for a moment slipped beneath the ropes after closing to get to the real deal any chance I get. Luckily for me, my sweet and adventurous husband feels the same. We want to walk where the Croatians walk, sip what the Czechs sip & eat what the true blue Romans eat when they sit down for dinner. L'archetto. Hands down the best food (and house wine) in all of Rome. You can keep the 5 star hotel rooftop restaurants, when it comes to pizza I gotta have real, Italian pizza. 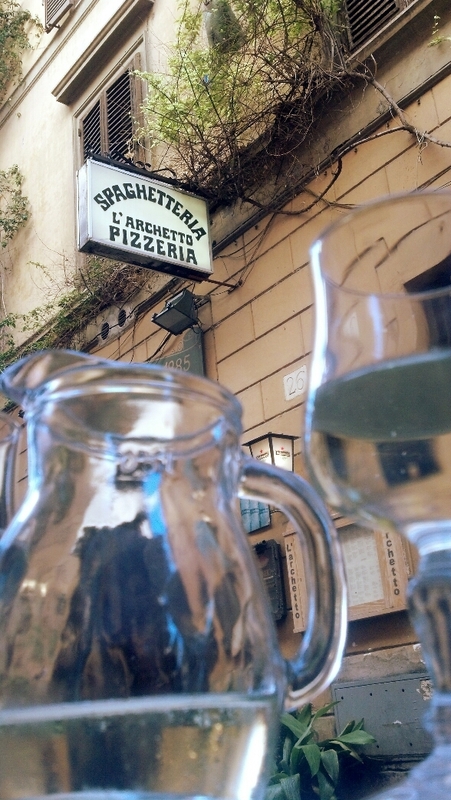 Just steps away from the Fontana di Trevi, L'archetto is perfectly situated. Convenient... yet tucked away from the prying eyes of smelly tourists. (And no, I do not consider Wilhelm and myself tourists, thank you very much. We are explorers, and there's a great difference). I can say with certainty that I fell more in love with this handsome, black-haired goof of mine as I watched a mesmerized look grow over his face as he experienced his first bite. Quickly though the look of wonder changed to one of devastation. As he realized his pasta vodka could never compare, I watched the little wheels turning in his head, "For better or for worse...sharing in want and in plenty...what's yours is mine? Legally, does 50% of that cheesy deliciousness belong to me!?". Man he's really putting my vows as a wife to the test here!! When all was said and done, I, (somewhat begrudgingly), shared the coveted four cheese pizza and we all but licked the plates clean. Normally at the start of an adventure I would have a dramatic post detailing the grim travel hoopla that is ever-expected when flying internationally (and when going on zero sleep...and after having packed just hours before the flight)...but no such story today! A tad boring, but we arrived at the Southwest Florida Int'l Airport on time, our bags weighed under the allotted 50lbs and we boarded the flight to Rome, Italy with no complications. Not only that, but the plane was quite empty so we hustled for a row with extra seats. I made myself a cozy bed with 5 airplane pillows and approximately enough little blue blankets to cover the entire Airbus A330 aircraft and with the help of an Advil PM I woke up 9 hours later to a "Buongiorno" from my gorgeous husband and a lemon muffin top from our lovely flight hostess.